If your teeth are hopeless and you want them all extracted, you may want what is called an immediate denture. This is a denture that is placed in your mouth the same day that the teeth are extracted, so that you don’t have to go six weeks or longer without any teeth. It ends up costing more than it would if you waited before having the denture made. The reason is that, when it is made, it fits your jaw closely, but not exactly. Therefore, it will need to be relined sometime within the first six months, and that will be an extra expense. A lower immediate denture is placed right on top of the bony ridge on the lower jaw. There are usually sutures present when it is first placed. Those sutures will be removed after about a week. And while generally it is reasonably comfortable, there can be some spots that are temporarily very sore. Because the fit is approximated, there can be places where the immediate denture rubs against your gums when it is first placed, which will be very sore until the dentist can adjust it. Since it covers over the surgical site and the tooth sockets, it helps keep that tender surgical area from becoming irritated, much as a bandage would. It’s important, when you have an immediate denture, that you follow the dentist’s instructions carefully. One key instruction is that you cannot remove it by yourself, even for just a few minutes, until your dentist tells you it’s all right. Because of the tendency that the tissue underneath has to swell, if you take it out for very long, you may never get it back in again. By the time you get to the dentist to get it placed back in, trying to adjust it will be hopeless. So consider this a word to the wise. Making an immediate denture isn’t complicated for the dentist. It just requires that the denture be made before the teeth are extracted. Usually a patient receiving a denture will be already missing a number of teeth. In some cases they may only have front teeth left. Rather than waiting until the teeth are taken out and the jaw has time to heal, for an immediate denture the dentist takes the impressions with the teeth still present. A model is made from that impression. 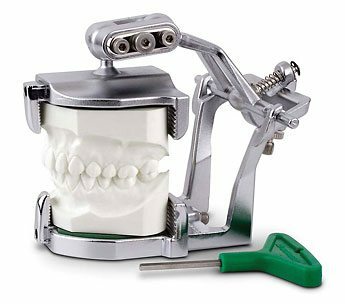 The models are then mounted on an articulator – a mechanical device that replicates the positioning of the upper and lower jaws in relation to each other. The dentist or a laboratory technician will then take the model and saw off the teeth that are to be extracted. Parts of the model representing soft tissue may also be ground down if their position is expected to change because the teeth are missing. The denture is then made to fit this altered model. The fit, of course, will be an approximation. But key landmarks will be unchanged, and the periphery of the denture, which is the part of the denture that creates the seal, will fit accurately. Some surgical alteration of the jawbone usually needs to be done at the time of placement of the immediate denture. Then, after the jaw heals and the extraction sites fill in with new bone, the denture is relined to a more precise fit. In the meantime, denture adhesives may be required as the jaws heal and it becomes more loose.